Winter is officially here, and I am freezing. The heating in my apartment leaves warmth to be desired and I constantly complain that I am freezing to death, but just to put this in perspective, it is sunny and I don’t even own a coat. Which, as I write this, I realize this might be the reason I’m so cold all of the time. 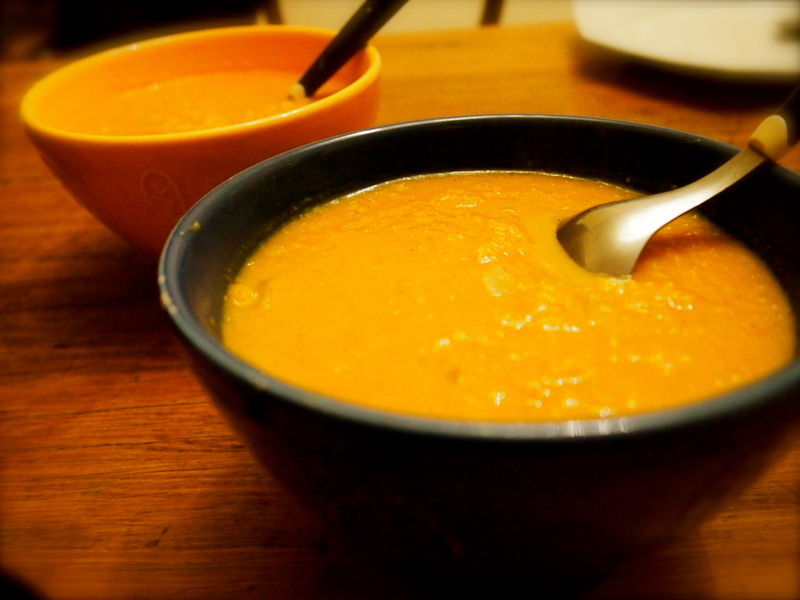 The best part about cold weather is definitely soup. And skiing. And sweaters. I developed a new spin on an old favorite: butternut squash. That sweet, fleshy beta-carotine-loaded pulp is the ideal vector to transmit heat from spoon to stomach. This soup is spicy and sweet, with a rich flavor collaboration of curry, coconut and cinnamon. It will definitely warm you up, in case you also don’t have a coat …. Cut the butternut squash in half and roast in the oven at 350 degrees for 15 minutes until soft. This isn’t necessary, but it makes the squash much easier to cut. Once the squash has softened, remove the skin and cut into two inch chunks. Set to simmer in a large pot, covered with 1 inch of water. Add the cinnamon and cover. Peel the carrots and quarter the apples. If you own a juicer, juice the apples, carrots and ginger. Set the juice aside, and collect the pulp. If you own a food processor, finely chop the raw vegetables. If you own a knife – get chopping. Dice the onion and saute it with the curry powder until translucent. Add the pureed apple carrot mixture and saute with some water. 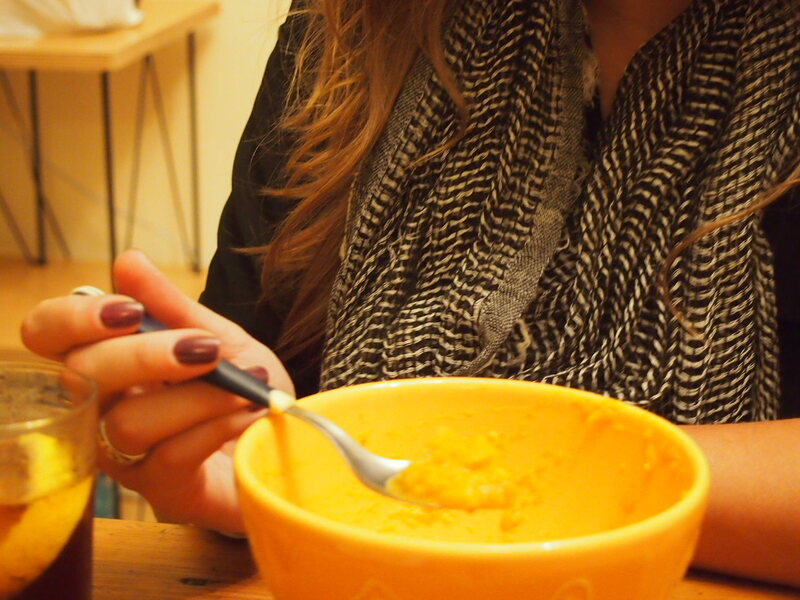 When the butternut squash is soft, use a hand masher to puree it. You can also use a blender. Add the onion/apple/carrot and mix well. Add the coconut milk and water (and carrot/apple juice, if you used a juicer) until soup reaches desired consistency. Add salt to taste. Stir and simmer for a few more minutes. This recipe makes at least 10 servings, and the soup can be frozen. Provecho!